One of the top five campgrounds on our 94 day Alaskan adventure. Excellent facilities, outstanding staff, wonderful walking trail adjoining the RV park, sites were very level, easy pull throughs and more than adequate retail, food, and fuel opportunities. Limited number of 50 Amp sites, so book early if that's important to you. This is one of those RV parks for which reservations are highly recommended, especially since caravans stay here en route to Alaska. We always enjoy our stay at this facility. What impresses us most are the well manicured sites, proximity to Bow River and access to Canmore. Our only concern is the $2 charge for showers. We feel when you have already paid for water, you should not pay again for bathroom/shower services. This is the best run campground at which I have ever stayed. Everything is operational, extremely neat, up-to-date, and exceptionally clean. Abuts the river and great paved trail. These people should teach others how to run a great campground! Thanks for the great review! 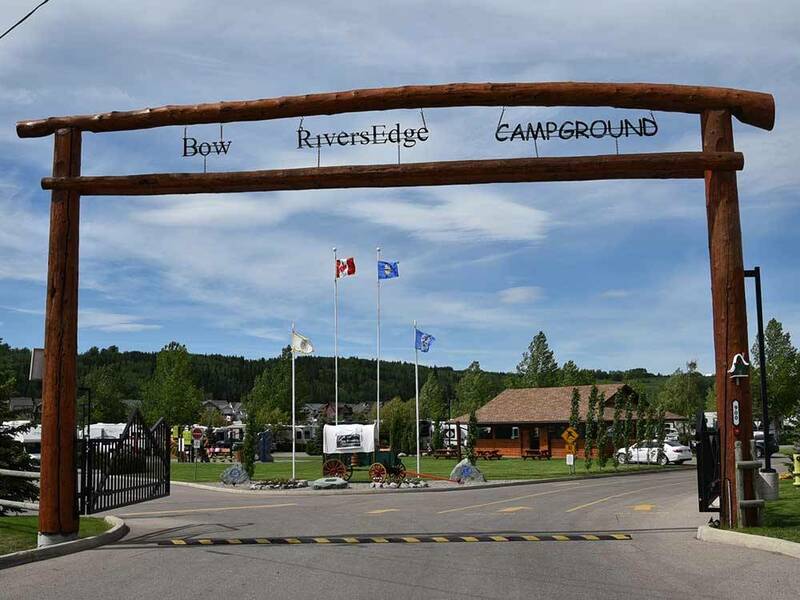 We love what we do here and love to make people feel welcome and safe at our campground! Hope to see you again next summer. Lots to do in our backyard of Alberta! Large well maintained campsites with asphalt roadways and privacy provided by hedges and trees. Clean restrooms and showers. Convenient access to Calgary yet located in a quiet area adjacent to the Bow river. This is a wonderful camp ground. We stayed at BRE several times this past summer, but September was our last stay. We are repeat customers because we thoroughly enjoy our stays here. The sites are landscaped very nicely providing some privacy and all of them have grass and gravel for the RV. They are a little narrow, but still room to move around with slides on both sides of the RV. The location of the fire pits in some of the sites is inconvenient - closer to the road rather than really in your site - but it's a small complaint. No major roads around it, so the campground is very quiet in the evening. One of the nicest features is the location to the Bow river and a beautiful walking path and off leash area for dogs. We've walked this path many times and never tire of it. Watching the dogs running and playing on the path is also very entertaining! A huge rec centre is also nearby - easy walk. There is a building with BBQs, tables, chairs and a large grassy area that can be rented for large groups, family reunions, etc. for group gatherings, meals, entertainment, etc. The staff are friendly and professional. The grounds are really well cared for and the washrooms are exceptionally clean. Two thumbs up for this park for sure! We stayed one night at the end of a long journey and it was a very nice rv park. well manicured and clean restrooms Very friendly staff. Well thought out campsites. This is a beautifully maintained park on the edge of the Bow River (as the name suggests). Each site has a grass area, extra gravel parking for the tow vehicle and guest, a picnic table and fire pit. The sites are separated by shrubs and trees. The sites could be wider but units with slides on both sides will fit on the gravel pads leaving adequate room for the picnic table, awning, lawn chairs, and BBQ. The best feature of this park is the distance from any busy roads (it is at the end of a street) and is sided by an industrial yard and a rec center (so very quiet at night) and the river. Between the river and the park fence is a paved walking trail and off-leash dog park. Our dog loves the freedom to run, snoop and meet new four-legged friends. There is good access to the river downstream from the RV park. A visit to Cochrane Ranch historic site and to MacKays Ice Cream are recommended if you visit the area. We just completed a five and a half week, 15 state and 1 province trip. This was by a considerable margin the finest RV park we stayed in. We did not have reason to use the restrooms, but I checked them out and they are immaculate. The property is adjacent to the Bow River and there is a very nice walking/biking trail along the river. We had a full hookup site which had lovely greenery separating it from the next sites.